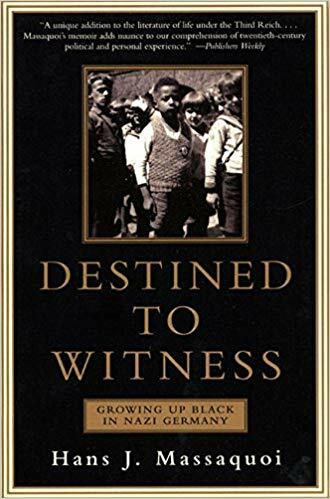 This is a story of the unexpected.In Destined to Witness, Hans Massaquoi has crafted a beautifully rendered memoir — an astonishing true tale of how he came of age as a black child in Nazi Germany. The son of a prominent African and a German nurse, Hans remained behind with his mother when Hitler came to power, due to concerns about his fragile health, after his father returned to Liberia. Like other German boys, Hans went to school; like other German boys, he swiftly fell under the Fuhrer’s spell. So he was crushed to learn that, as a black child, he was ineligible for the Hitler Youth. His path to a secondary education and an eventual profession was blocked. He now lived in fear that, at any moment, he might hear the Gestapo banging on the door — or Allied bombs falling on his home. Ironic,, moving, and deeply human, Massaquoi’s account of this lonely struggle for survival brims with courage and intelligence.